Well, I finally did it! :-) Purchased a 'camcorder' or video camera. The reason for the purchase was that my wife and I are expecting a little one in mid to late October. Some of you probably thought it was for weather stuff. Well, I'll probably use it for that also! :-) But don't tell my bride! We need rain. All of these beautiful, sunny days aren't helping with the huge deficit. Remnants of the tropical depression that came on shore in Florida MAY help us by Tuesday night and onward through Thursday as an accompanying cold front barrels through. This will lower our temps by 10+ degrees. Speaking of temperatures, there is a great Autumn post over at NashvilleWx.com. You may click this link to go directly to it. Over at our baby blog, I've posted a poll as to what you think our baby will weigh at birth. Go check it out! Back to the weather, our 7-day forecast can be accessed by clicking here! Finally got a chance to sit down and watch the vidoes on the baby blog. I know you guys are excited!! 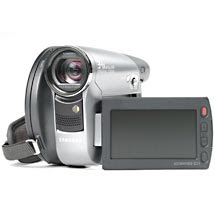 As for the "other reason" for buying the video camera , wink wink nod nod, your secret is safe with us on the team.